These “new ways” compel us to better understand the problem of malnutrition, to learn about the complexity of improving nutritional outcomes, to understand the role agriculture can play, and to collaborate across disciplines and sectors in order to design and implement interventions that can truly make an impact in improving the nutrition and well-being of the people we serve. Every country on earth has a malnutrition problem. In fact, malnutrition in its various forms is the leading cause of poor health in the world! Many populations suffer from multiple malnutrition problems, such as stunting, wasting, overweight, and micronutrient deficiencies (Development Initiatives 2018a). 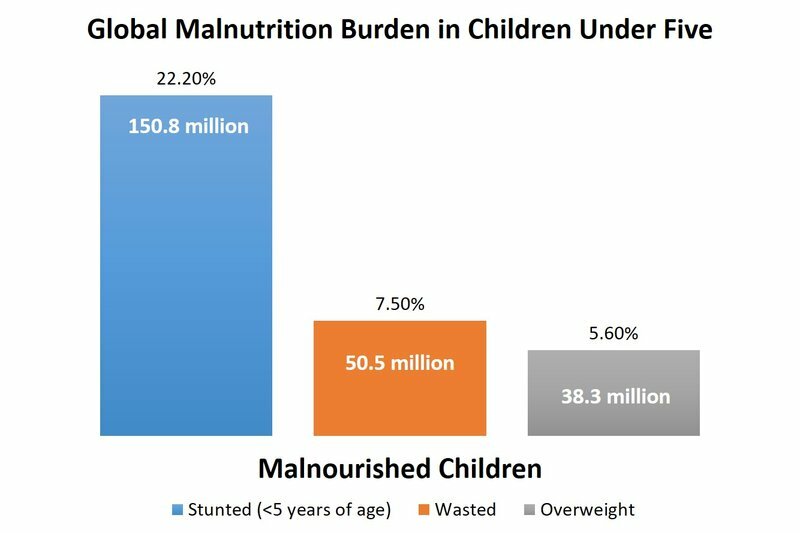 Figure 1: Global malnutrition burden in children under five. Source: Adapted from 2018 Global Nutrition Report. Development Initiatives; 2018. p. 12. Undernutrition alone was found to be the direct cause of 45% of all child deaths in low and middle-income countries—almost half of child deaths (Black et al. 2013). According to the 2018 Global Nutrition Report, 150.8 million children under five are stunted, 50.5 million are wasted, and 38.3 million are overweight (Figure 1). 20 million babies are born with low birth weight each year. One-third of all women of reproductive age are anemic –a debilitating condition caused primarily by micronutrient deficiencies. Moreover, 39% of adults globally are overweight or obese (Development Initiatives 2018a). In 2015, there were 4 million deaths related to overweight and obesity; two-thirds of those were due to cardiovascular disease (GBD 2015 Obesity Collaborators et al. 2017). Malnutrition in early childhood can irreversibly damage physical and cognitive development, affecting a child’s capacity to learn and succeed in school, increasing a person’s risk of infection and disease, and generally diminishing performance and earning potential throughout the lifetime. This damage represents a great cost in terms of healthcare expenses and lost productivity. Ultimately, it affects an entire country’s development and the well-being of its population (ThousandDays.org 2018). The World Health Organization (WHO) defines malnutrition as: “…deficiencies, excesses or imbalances in a person’s intake of energy and/or nutrients.” The term malnutrition covers two broad groups of conditions. One is ‘undernutrition’--- which includes stunting (low height for age), wasting (low weight for height), underweight (low weight for age) and micronutrient deficiencies or insufficiencies (a lack of important vitamins and minerals). The other is overnutrition, which includes obesity and diet-related non-communicable diseases (such as heart disease, stroke, diabetes and cancer)” (WHO 2016; Figure 2). Even though malnutrition can affect anyone, certain groups are more vulnerable. These include young children, pregnant and lactating women, adolescent girls, the elderly, the immuno-compromised (e.g. people with HIV/AIDS), indigenous people, and people living in poverty. People also become vulnerable to malnutrition during or after conflicts, disasters, and famines, or when other problems affect their food and nutrition security (Development Initiatives 2018a). Malnutrition is especially dangerous for women of reproductive age and for children in their first thousand days of life (i.e. from conception to two years of age), because malnutrition in these situations can have irreversible consequences. Figure 3: UNICEF’s Malnutrition Conceptual Framework. Source: Adapted from Understanding and Applying Primary Pathways and Principles. Herforth & Harris. USAID/SPRING Project; 2014. p. 11. 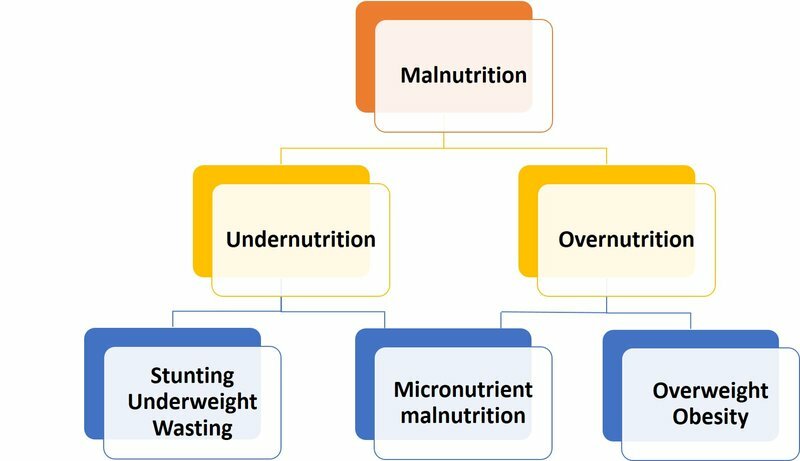 Approaches to address malnutrition can be described as being nutrition-specific or nutrition-sensitive. Nutrition-specific interventions address the immediate causes of malnutrition, and some of the underlying causes (UNICEF 2017). The Lancet 2013 Series on Maternal and Child Nutrition reported that stunting (an indicator of chronic undernutrition) can be reduced by 20% if core nutrition-specific interventions are scaled up to reach 90% of the target population (Bhutta et al. 2013). Examples of core nutrition-specific interventions include micronutrient supplementation for children and for women of reproductive age (e.g. zinc, iron, vitamin A, calcium and folic acid); promotion of exclusive breastfeeding during the first six months of life and of adequate complementary feeding from six months to two years of age; and prevention and treatment of severe acute malnutrition (SAM) and moderate acute malnutrition (MAM) in children (Bhutta et al. 2013). Nutrition-specific interventions are essential, but on their own they are not enough to reduce chronic malnutrition to more “acceptable” levels, much less to achieve a world free of hunger. This is why nutrition-sensitive interventions are also necessary. Nutrition-sensitive interventions address underlying and basic causes of malnutrition by integrating nutrition goals into interventions from other sectors, such as agriculture, education, health and WASH (water, sanitation and hygiene) (UNICEF 2017). 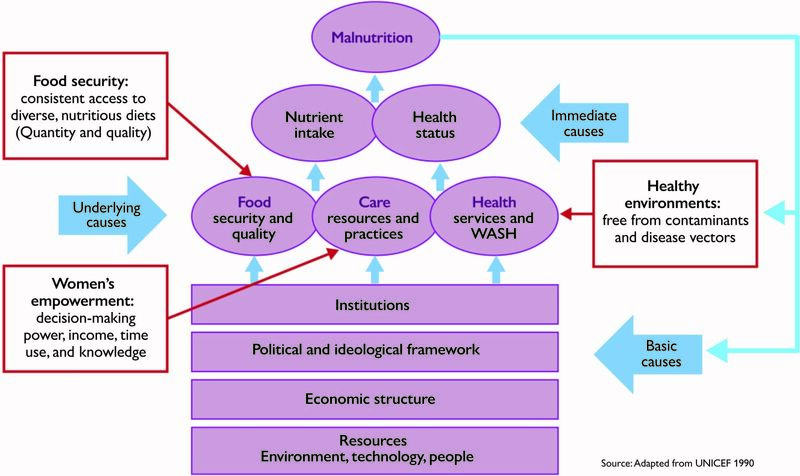 Figure 4 depicts the current framework that helps us understand the pathways that link agriculture and nutrition (Herforth and Harris 2014). The pathways are interconnected rather than linear. An understanding of how these interactions function in a particular context would help change agents know how nutrition-sensitive agriculture activities could improve access to food and healthcare, promote adequate caring practices and contribute to an enabling environment. These could eventually improve the nutrition of the entire household, not just mothers and children. Figure 4: Conceptual Pathways between Agriculture and Nutrition. Source: Understanding and Applying Primary Pathways and Principles. Herforth & Harris. USAID/SPRING Project; 2014. p. 3. 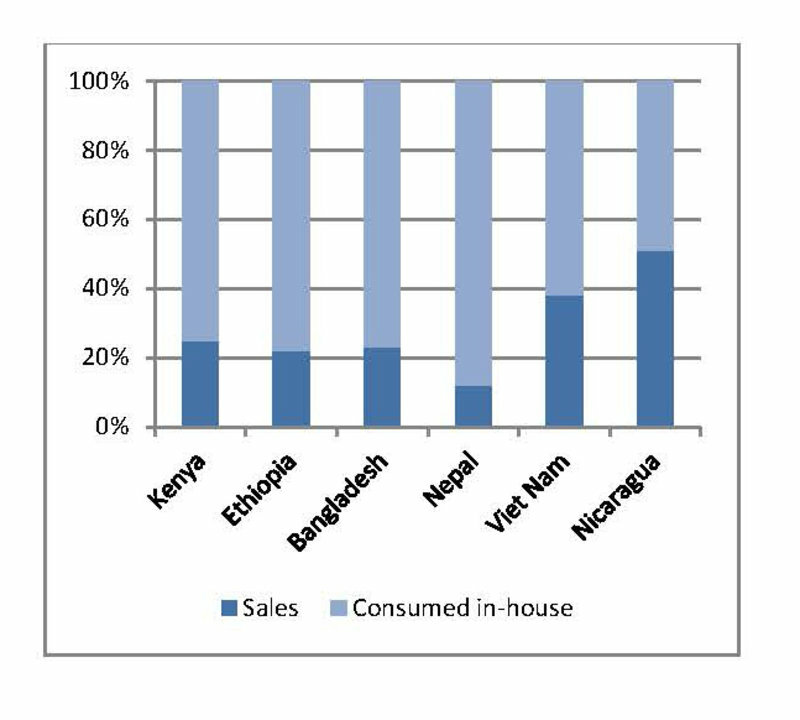 Figure 5: Smallholder agricultural production sold in markets and consumed in-house. Source: The economic lives of smallholder farmers. Rapsomanikis. FAO; 2015. p. 28. Food production may seem an obvious pathway from agriculture to nutrition, because it can directly affect the quantity and kinds of food available for consumption in smallholder households. It can also affect food availability and prices in local markets due to the sale of some farm produce. Farming families do not necessarily aim to produce all the food that would meet their dietary needs, or to consume all the food they produce. While many smallholder farmers do consume a large portion of the food they produce at their farms (Figure 5), they also spend a significant amount of their income to purchase food. If we account for food produced and consumed from the farm, plus food that is purchased, many smallholder farmers are net consumers; sometimes they spend more than half of their household budget on food (Rapsomanikis 2015). Farming families consider many factors when producing crops or livestock: costs, risks, market prices, productive assets (e.g. land, farm tools), and their own household needs and preferences. When preferred foods are not consistently available, affordable or accessible in markets, the production pathway could be a good option to address both food and nutrition security (Herforth and Harris 2014). Improving the production of a staple crop. This would increase its availability for household consumption, which would in turn increase dietary intake of protein and energy, which could result in improved nutritional outcomes. Promoting the cultivation and consumption of micronutrient-rich foods (e.g. from home gardens) among households that depend mainly on staple crops. This could improve the quality and diversity of the family’s diet. Substituting a known crop or variety with a similar one that contains more iron or Vitamin A, more protein, or better-quality protein. Examples include orange-fleshed sweet potato, quality protein maize, and beans biofortified with iron. These interventions could increase food access in farming households, if they are thoughtfully designed and if they successfully meet food production goals. Food processing and storage, one of the steps in the food production pathway, can affect—for good or ill—how much food is available, and for how long. It can also affect the health of the family. Post-harvest management can affect food’s shelf-life, nutrient content, and safety. For example, drying a crop can increase its shelf life. However, if dried improperly, mold can grow on the crop and produce mycotoxins; when consumed, these can have acute and/or chronic effects on people’s health. Improving food access alone does not guarantee improved nutrition outcomes. As mentioned above, the pathways are not linear, and their components are interrelated. As illustrated in Figure 6, a nutrition-sensitive program needs to also consider access to healthcare and child care practices, because healthcare influences health status, and caring practices influence nutrition outcomes. Improving nutrition outcomes is the ultimate goal, so all three need to be addressed. Key components of the enabling environment also need to be considered; these include markets; natural resources; health, water, sanitation; and nutrition and health knowledge/practices. Figure 6: Food Production Pathway. Source: Adapted from Understanding and Applying Primary Pathways and Principles. Herforth & Harris; 2014. p. 3. All these pathways might seem overwhelming. You may wonder how this can possibly all be accounted for in your small agriculture program. One single organization does not need to address every aspect in the pathway. Instead, seek to understand the pathway and its interactions within this framework, and then look for ways to collaborate and partner with people who work in other areas of influence. As you complement each other’s work among a target population, your joint efforts can achieve your mutual goals for improved nutrition outcomes. An example of this is the Home Gardens Program that Maya Health Alliance (MHA) is piloting in Guatemala. Globally, Guatemala has the sixth-highest rate of chronic malnutrition; 47% of children under five are stunted (USAID 2018; Development Initiatives 2018b), and this number rises to 70-80% among the Mayan communities that MHA serves. After implementing nutrition-specific interventions that helped reduce chronic malnutrition by 15-20% in these communities, MHA decided to design and pilot a home gardens program with the goal of improving access to a more diverse diet for better nutrition outcomes. In 2018, MHA teamed up with ECHO and other organizations to bring diverse perspectives into the program design phase, including people with backgrounds in nutrition, public health, agriculture, and program management. Having diverse perspectives equipped the team to identify foods already being produced by the households, to understand home garden methods used by the communities, to develop a seasonal calendar, to recognize water needs (e.g. irrigation, household use), to respect women’s use of time (e.g. child care), to create training tools, and to adapt the nutrition education component, among other things. All these important elements required time, mutual learning and adaptation, in order to design an evidence-based home gardens program that would complement the nutrition-specific interventions and reduce the incidence of chronic malnutrition among these communities. If successful, the results of the process and the impact of this pilot program will be shared and scaled up to reach more communities. The agricultural income pathway aims to increase household income, so that more money is available to meet the nutritional needs of the household—in terms of food purchases, but also of non-food purchases (for example, related to clean water and sanitation facilities) that would improve living conditions and support good nutrition. This pathway is appropriate when diverse foods are available and affordable locally, to meet the nutritional needs of the family—women and children in particular. The pathway is best used when inputs, resources and markets work well to meet nutritional needs throughout the year. These conditions may not be optimal, and require collaborations and consideration into program design; for example, using value chain approaches (discussed below). Moreover, many smallholder farmers sell at least part of their farm products for household income (see Figure 5), and many produce cash and/or non-food crops, making the agriculture income pathway necessary for improving nutrition. As with the food production pathway, be sure to look at the different aspects and interactions within the framework, and design programs carefully. Do not assume that increased income will automatically be spent on nutritious foods and healthcare. Consider using social and behavior change (SBC) approaches to improve knowledge and practices related to nutrition. The USAID Health Communication Capacity Collaborative (HC3) Website is an excellent toolkit and training resource in this subject (USAID/HC3 2018). The women’s empowerment pathway gives the agriculture-to-nutrition framework a gender lens. It describes the impact of women’s spending power; of their responsibilities for childcare and housekeeping; and of the amount of time and energy women spend. When a program aims to increase women’s income from agriculture, the women’s empowerment pathway connects to the agricultural income pathway. Studies have shown that when women have decision-making power over the household income, they are more likely than men to spend it on food and healthcare, particularly for their children. Women’s ability to control household economic and productive resources (including their own time) positively correlates with improved self-care and child care practices. In general, it correlates with better decisions to invest in the nutrition, healthcare and well-being of children (Smith et al. 2003). This means that an initiative to increase women’s control of agricultural income can enhance the income pathway to nutrition, since money will be spent for things like food and health care, which directly affect children’s nutritional status. Training that helps female and male farmers to gain farm management and business skills could also enhance this pathway (Herforth and Harris 2014). When planning for a project that involves women, be sure to consider how much time and energy they will need to spend on agricultural activities, and also consider when the work must be done. In many parts of the world, women participate in agriculture activities, but also bear the main responsibility for child care and household care. Be careful to ensure that your agriculture program does not unduly burden women with overwhelming expectations of time or energy. For a more in-depth explanation of the agriculture-to-nutrition pathways, please read the “Improving Nutrition through Agriculture Technical Brief Series” produced by the USAID/SPRING Project. Another important aspect of agriculture to nutrition is the pathway that farm produce takes from the farm to the consumer, known as a value chain. A value chain is the set of steps, processes and participants that relate to a specific product (or related products), including production, transformation, transportation and sale to the consumer. Those employed within the value chain earn income that can be used to buy food or to pay for health care, improving nutrition and health. A value chain can yield new and/or improved nutritious foods and products for vulnerable populations to access and consume. Some processes used in a value chain can reduce waste and nutrient loss, or can increase the availability of nutrients (e.g. fortification). Nutrition-sensitive activities can be incorporated within the value chain. For example, the value chain can include nutrition education; facilities that allow and promote breastfeeding; and marketing messages to improve the nutrition knowledge and practices of the consumer. With the inclusion of agribusiness and markets in the agriculture-to-nutrition pathways, some have suggested that the terminology be changed from “nutrition-sensitive” agriculture to “nutrition-smart” agriculture. The latter term might encourage producers and value chain actors to adjust their business strategies, to consider the nutrition and health of vulnerable populations and of society in general, in addition to considering their own profits (Arias and Htenas 2018). Whichever term is used, nutrition-sensitive or nutrition-smart, the value chain pathway includes tools such as market and value chain analysis, and also principles and program design strategies for value chain development. You can read more on these concepts from IFPRI’s (International Food Policy Research Institute) brief, “Value Chains for Nutrition” (Hawkes and Ruel 2011). Some great resources for practitioners are MEDA’s (Mennonite Economic Development Associates) toolkits for market research (MEDA 2007a) and value chain program design (MEDA 2007b), available online. Now that we better understand the agriculture-nutrition pathways and nutrition-smart investments through value chains, we also need to consider the current guiding principles. These are necessary for effective program design and implementation. Incorporate explicit nutrition objectives and indicators into program design. This ensures that improving nutrition is a priority from the beginning. Assess the local context. What challenges and resources already exist in the community? Target the vulnerable and improve equity. Malnutrition hits some groups harder than others. Collaborate and coordinate with other sectors. Malnutrition has many underlying causes. Maintain or improve the natural resources base. Safeguard water resources especially. Empower women. The women’s empowerment pathway explains why this is so important. Facilitate production diversification, and increase production of nutrient-dense crops and small-scale livestock. Diversity contributes to resilience and to better nutrition. Improve processing, storage and preservation. These can help retain nutrients, reduce crop losses, and decrease the time it takes to prepare nutritious meals. Expand markets for nutritious foods and market access for vulnerable groups. This might be done through farmers’ associations and/or creating value-added products. Incorporate nutrition promotion and education. Try to build on local knowledge. These guiding principles, the result of a multi-year consultative process led by the Food and Agriculture Organization of the United Nations (FAO), can be found in their publication, “Key Recommendations for Improving Nutrition Through Agriculture and Food Systems” (FAO 2015b). Synthesis of Guiding Principles on Agriculture Programming for Nutrition (FAO 2013). Designing Nutrition-Sensitive Agriculture Investments (FAO 2015a). Malnutrition is a widespread problem, with irreversible and generational consequences–especially for vulnerable populations like women and young children. Malnutrition’s causes are complex, related to an individual’s diet, but also to her health status and to household conditions that include food (in)security, childcare practices, and the environment. At a more basic level, the causes of malnutrition are even more complex, affected by the education system, kind of infrastructure, and availability of resources. We need both nutrition-specific and nutrition-sensitive interventions in order to address these complex causes. Nutrition-sensitive agriculture programs can contribute to the solutions, but improving agriculture production does not automatically improve nutrition for farming families. When we understand the agriculture-to-nutrition pathways and principles, we can design and implement programs that are more effective. No single organization can adequately address malnutrition. We need to learn about the connections and interactions within these pathways, collaborate with other individuals and organizations that work in complementary areas (e.g. nutrition, gender equity, health, agribusiness, etc. ), and become bridge builders. Only then will we be able to unleash agriculture’s potential to improve the nutrition and well-being of the most vulnerable. Nutrition-Sensitive Agriculture Training Resource Package, produced by the USAID/SPRING Project. This package includes the themes covered in this article and more, such as developing a seasonal calendar and behavior change concepts (USAID/SPRING Project 2018). USAID’s Online Training Course on Nutrition-Sensitive Agricultural Programming. This interactive 3-hour video course has modules on basic nutrition concepts, agriculture-to-nutrition pathways, and nutrition-sensitive programming (USAID n.d.). The New Extensionist Learning Kit (NELK) by the Global Forum for Rural Advisory Services (GFRAS) recently added Module 16: Nutrition-Sensitive Extension. The new module includes a manual, workbook, presentation and guide that cover some basics about nutrition and that also refer to topics discussed in this article (GFRAS 2018). Introductory Workshop on Integrating Gender and Nutrition within Agricultural Extension Services: Facilitators Guide (USAID/INGENAES Project 2016b). Integrating Gender-Responsive & Nutrition-Sensitive Approaches When Working with Farmer Groups Engaged in Markets: A Training of Trainers Manual (USAID/INGENAES Project 2016a). The Key Nutrition Resources collection on ECHOcommunity.org. Linking Agriculture and Nutrition, which is a main theme of the USAID/SPRING Project. This article includes many references to USAID/SPRING materials, including their agriculture-to-nutrition pathways framework. A Toolkit on Nutrition-Sensitive Agriculture and Food Systems has also been made available by the FAO, which includes the previously mentioned key recommendations and program design documents, as well as a compendium of indicators for nutrition-sensitive agriculture, programmatic options, and guidelines on understanding the causes of malnutrition. The Agriculture-Nutrition Community of Practice (Ag2Nut CoP) is an independently run and diverse community. The Ag2Nut Community platform allows members to connect with each other via its online platform, email, and webinars. The Agriculture, Nutrition & Health (ANH) Academy is a global research network that helps academics and practitioners connect through their learning and sharing platform. Innovative Methods and Metrics for Agriculture and Nutrition Actions (IMMANA) is a research initiative trying to close evidence gaps and to generate new scientific evidence in agriculture-to-nutrition linkages. Bhutta, Z.A., J.K. Das, A. Rizvi, M.F. Gaffey, N. Walker, S. Horton, P. Webb, A. Lartey, R.E. Black, and the Maternal and Child Nutrition Study Group Lancet Nutrition Interventions Review Group. 2013. “Evidence-Based Interventions for Improvement of Maternal and Child Nutrition: What Can Be Done and at What Cost?” Lancet 382: 452–77. Black, R.E., C.G. Victora, S.P. Walker, Z.A. Bhutta, P. Christian, M. de Onis, M. Ezzati, et al. 2013. “Maternal and Child Undernutrition and Overweight in Low-Income and Middle-Income Countries.” Lancet 382: 427–51. Development Initiatives. 2018a. 2018 Global Nutrition Report. Bristol, UK: Development Initiatives. ———. 2015a. “Designing Nutrition-Sensitive Agriculture Investments - Checklist and Guidance for Programme Formulation.” Food and Agriculture Organization of the United Nations (FAO). GBD 2015 Obesity Collaborators. 2017. “Health Effects of Overweight and Obesity in 195 Countries over 25 Years.” The New England Journal of Medicine 377: 13–27. GFRAS. 2018. “GFRAS - NELK Plus Module on Nutrition-Sensitive Extension.” 2018. Girard, A.W., J.L. Self, C. McAuliffe, and O. Olude. 2012. “The Effects of Household Food Production Strategies on the Health and Nutrition Outcomes of Women and Young Children: A Systematic Review.” Paediatric and Perinatal Epidemiology 26 (July): 205–22. Hawkes, C., and M.T. Ruel. 2011. “Value Chains for Nutrition.” Washington, D.C.: International Food Policy Research Institute (IFPRI). Masset, E., L. Haddad, A. Cornelius, and J. Isaza-Castro. 2012. “Effectiveness of Agricultural Interventions That Aim to Improve Nutritional Status of Children: Systematic Review.” BMJ 344: d8222. MEDA. 2007a. Market Research for Value Chain Initiatives - Information to Action: A Toolkit Series for Market Development Practitioners. Mennonite Economic Development Associates (MEDA). ———. 2007b. Program Design for Value Chain Initiatives - Information to Action: A Toolkit Series for Market Development Practitioners. Mennonite Economic Development Associates. Rapsomanikis, George. 2015. The Economic Lives of Smallholder Farmers. Food and Agriculture Organization of the United Nations (FAO). ThousandDays.org. 2018. “Why 1,000 Days.” 2018. UNICEF. 2013. Improving Child Nutrition: The achievable imperative for global progress. USAID/INGENAES Project. 2016a. Integrating Gender-Responsive & Nutrition-Sensitive Approaches When Working with Farmer Groups Engaged in Markets: A Training of Trainers Manual. ———. 2016b. Introductory Workshop on Integrating Gender and Nutrition within Agricultural Extension Services: Facilitator’s Guide. USAID/SPRING Project. 2018. “Nutrition-Sensitive Agriculture Training Resource Package.” Training Package. USAID. n.d. “Online Training Course on Nutrition-Sensitive Agricultural Programming.” Accessed January 10, 2019. Another dimension of malnutrition is dietary energy balance as it relates to the economic opportunities of the beneficiaries such as smallholder farmers. Most of the time the economic opportunity relies on heavy manual labor with a caloric demand of 4000 kcal/day against a typical availability of on 2000 - 2500 kcal/day. This than forces many compromises. They are reviewed on several pages of www.smallholderagriculture.com website I manage. Please visit and start with: https://webdoc.agsci.colostate.edu/smallholderagriculture/ECHO-Diet.pdf . This is an article you published a few years back. I have recently submitted to FAO for their upcoming publication on Nutrition some case studies of the affordability of quality nutrition. I will try and paste in a draft copy if it will fit within your comment limits. The article is: Affordability of Improved Nutrition While Optimizing Economic Opportunities R L Tinsley Introduction From an agronomy perspective the interest in improved nutrition is how malnutrition and under nutrition impact crop management and ultimately household food security. For smallholder farmers this is the calories needed of manual labor they are expected to undertake in producing their crops and managing their animals. However, it looks like most of the nutritional effort to date is concentrate on the science of nutrition and what constitutes an appropriate diverse diet, with an emphasis on pregnant and nursing women. While this is an important consideration, it must also be recognized that someone must be earning wages to purchase the improved diet, and this will require some heavy manual labor and calorie exertion. The overall dietary needs have are well understood, so that the science of Nutrition is fully define, only needing some “fine tuning”. Thus, should the nutrition effort start shifting focus to integrating the science of nutrition into the economic circumstances of the beneficiaries and what compromises they rationally make in adopting the improved scientific derived diet to their specific economic circumstances. Do these compromises separate the Science of Nutrition from the Art of Nutrition or the academic, where knowledge is the endpoint from development where endpoint is acceptance, or an understanding of what acceptance is limited? Before embarking on large scale extension/education effort to educate our beneficiaries on improved nutrition, should time be allocated to make certain the beneficiaries have sufficient discretionary control to take advantage of improved nutrition or are they forced to make serious compromises, particularly for the caloric energy needed to optimize their economic opportunity which is largely associated with heavy manual labor. While it is often recognized that people are poor and hungry, rarely is this identified as a major hinderance to their economic opportunities. How much priority should be given to obtaining sufficient calories to optimize economic opportunities at the expense of a more diversified diet? If the economic circumstances are not factored in will an extension/education program be mostly badgering beneficiaries with information they are reasonable familiar with but don’t have the means of fully utilizing. There are three questions: 1. What are the caloric requirements for a manual labor for smallholder farmers or other laborers such as porters living on minimum wage? 2. How affordable would an improved diet be with a minimum wage and what are the rational compromises they would make in optimizing the quality of the diet with energy needed for their manual labor tasks? 3. How much priority will be given to calories needed to optimize economic opportunities vs. more balanced diversified diet? Dietary Energy Requirements Typically, manual agriculture labor such as land preparation with a hoe will consume 300 kcal/hr. and require 300 hr. of diligent effort per hectare. However, the 300 kcal/hr. includes the basic metabolism estimated at 2000 kcal/day or 80 kcal/hr. Thus, subtract that from the 300 kcal/hr. and work consumption is 220 kcals/hr. If working 9 hr./day this would be 220 x 9 = 1,980 kcal of work energy. To this must be added the 2000 kcal for basic metabolism making a total of 3,980 kcal/day which for discussion purposes rounds up to 4000 kcal/day as a computed estimate, subject to confirmation. Anything less will mean a decline in the workday or paced with declining diligence, either resulting in declining economic output and prolonging time to complete specific tasks such as crop establishment. The 4,000 kcal/day represents a substantial amount of food (Fig. 1). In the tropics with 12-hour days and night all year, the 9 hr. work day could represent the maximum practical daylight opportunity. The 4000 kcal/day manual labor caloric requirement is substantially (30%) greater than 2800 to 3000 kcal/day exerted by active people with a healthy exercise regime . Table 1. Typical Kcal/Day Available to Smallholders Location*	Kcals*	Diligent Work Hours** Ghana 2,930	4.2 Bangladesh 2,480	2.1 Tanzania 2,140	0.5 Zambia 1,880	Unable to Work Kerala, India 2,010	0.0 *Source: http://www.odi.org.uk/sites/odi.org.uk/files/od i-assets/publications-opinion- files/8376.pdf ** (Kcal -2000)/220 Against this 4000 kcal/day need there appears surprisingly little available information on calories available to smallholders or other manual laborers. Apparently, the energy available for smallholder relying on manual labor has not be a high priority for development effort. What is available indicates most smallholders have access to only 2000 to 2500 kcal/day (Table 1). This is only enough to meet basic metabolism, with little energy to engage in heavy manual labor, perhaps 2 hours of diligent effort but paced over 4 or 5 hours. The result smallholder farmers taking up to 8 weeks for crop establishment over the entire farm, typically 1 to 1.5 ha. After 8 weeks, the potential yield has drop by about 50%, possible more. This 2000 kcal/day is also consistent with farmer interviews in Malawi and Ethiopia indicating retained subsistence stocks of maize at 200 kg/adult/year in Malawi and comparable combination of maize and potatoes in Ethiopia. Two hundred kilos of maize would pro rate to 0.55 kg/day and provide 2000 kcal. This will meet basic metabolism, but the farmers would need substantial additional food to accommodate the 4000 kcal computed work requirements. Also, the per capita consumption of rice in Madagascar is 115 kg/year amounting to only 315 g/day which will provide a diet of only 1,121 kcal/person, half the basic metabolism and quarter the energy for manual labor as mentioned above. Rice is the staple food of Madagascar. Case Studies Looking at case studies of buying power vs. wages the difficulty of obtaining an improved diet can be easily illustrated even though the consumer prices in host countries are only a fraction of the USA or EU prices. The case studies will rely on a hypothetical family but use real wage and consumer prices data. It will use the 4000 kcal/day estimated calorie need and seek to include an egg a day for the children as emphasized in World Bank Webinar and FAO E-consultation . The Family: The family is husband who is the sole source of income, wife mostly engaged in domestic chores, pre-school son and toddler daughter. The husband loves his family and wants to provide them as best he can, including providing the young children an egg a day to minimize stunting as promoted in the World Bank Webinar. Unfortunately, his economic opportunity is limited to being a porter, perhaps one of the most deeply poverty entrenched laborers frequently overlooked by the development community. His work piece is meal manhandling 100 kg bags, hopefully without wrenching his back and being forced to miss a week of economic opportunity to recover, but without any income. The family basic caloric needs are: • As a heavy manual laborer, the husband needs at least 4000 kcal/day • The wife doing mostly domestic work around the house including spending several hours getting water, firewood, and child care will need 3000 kcal/day • The pre-school child will need 1200 kcal/day and • The toddler daughter will need 550 kcal/day. The total family energy requirement will be 8750 Kcal/day. Angola: First locate the porter and family in Luanda, the capital of Angola, where he earns piece meal income loading or unloading 10-ton lorries. His typical daily wage is $2.50 for working as part of 6-man teams loading or unloading 5 10-ton lorries typically filled with 120 100kg sacks per day. The wages represent $0.50/lorry/person. The $2.50/day is set to equal the government established agriculture casual labor wage for Angola at 250,000 A0A/mo. Which with an exchange rate of $ = 3300 AOA provides a monthly income of $75 and a daily income of $2.50. Of this $2.50 he earns he can only spend $2.00 on food as he still has non-food costs for transport, rent, cooking fuel, light at night, etc. At the current Consumer Prices in Angola , if you spend the whole $2.00 on maize meal as the primary staple food in Angola he could purchase 1.7 kg maize meal which would provide only 6000 kcal/day . With nothing else, and would leave a daily deficit of 2500 kcals. No opportunity for substituting some beans to increase the protein in the diet but will reduce the calories and work potential, let alone some green vegetable to enhance the vitamins and mineral consumption. That highly desirable egg to minimize the little girl’s stunning is out of the question. If they spent the $0.40 for an egg, it would reduce the porter’s ability to load or unload the lorries. He likely will quit after only 4 lorries, coming home early but with $0.50 less income. Keeping the wage rate and consumer prices as stated what adjustment could be made in food purchased. This is an example of the Hard Choices: Compromises in Quality Nutrition many impoverished people have to make. Transferring the impoverished family to a smallholder farming community and the question is what can they produce to meet the family’s dietary needs? In this case the farmer has retained two 100 kg bags of maize per adult for subsistence use (based on Malawi interview with similar results from Ethiopia). The 200 kg of maize per year will provide a daily diet of about 2000 kcal, just enough to meet basic metabolism needs for the husband and wife, but not necessarily the children. This does not allow for any manual agronomic field work. Thus, the family must have some additional stocks of beans, etc. or purchase additional food. They do have a few “chickens that forge around the homestead and providing a couple eggs a day. What should they do with the eggs? They can sell them for $0.40 ea. or provide them to their daughter to minimize the stunting. If they sell the eggs, mentioned as a common practice in the World Bank Secure Nutrition webinar, they could buy 300 g of maize meal that would provide sufficient energy for 3 to 4 hours of diligent agronomic field work, that ultimately assist in improving the family’s overall food security. What is the rational thing for the farm family to do? Again, this represents Hard Choices10. What adjusts are possible to better provide the quality nutrition and food security to this smallholder family? How effective will an extension/educational program on quality nutrition be for this family deeply entrenched in poverty? Madagascar: If the hypothetical family moved to Antananarivo the capital of Madagascar where our porter is employed along with a couple companions pushing heavily loaded hand carts through the hilly streets. Again exerting at least 4000 kcal/day. Here the legal minimum monthly wage is 450,000 Ar. which with an exchange rate of $1 = 3280 Ar is a monthly income of $137, and daily allowance of $137/30 = $4.57 and if they allocate 80% for food the daily food expenditure is $3.60. Table 2. Possible Daily Food For Family of 4 Earning Minimum Wage in Madagascar Item	Amount	Cost ($)	Calories (Kcal)	Protein (g) Rice	1.7 kg	$ 0.99	6,205	121.2 Dry Beans	0.5 kg	$ 0.50	1,285	100.0 Eggs	4 ea	$ 0.70	289	24.0 Fish	0.25 kg	$ 0.53	150	8.4 Milk	0.5 lit	$ 0.43	32	1.7 Mix. Veg	0.3 kg	$ 0.18	90	2.0 Veg. Oil. 0.1 lit	$ 0.16	857	0.0 Totals	$ 3.49	8,899	257 The family will still need a daily diet of at least 8750 kcal to meet both basic metabolism and optimizing economic opportunity as a porter. The 8750 kcal requires 2.4 kg of milled rice, the staple food for Madagascar and cost only $1.40 or approximately 1/3rd food allowance. Thus, the Madagascar family has the opportunity for a more diversified nutritious diet than the Angola family. This will allow them to reduce their rice consumption to allow for some dry beans that will provide both calories and protein. They can also provide each family member with an egg, plus half a fish divided among the family (the typical marketed fish such as tilapia is approximately 0.5 kg), provide each child a glass of milk, share 0.3 kg of mixed vegetables, and still use a 100 cc of vegetable oil to prepare the food. Thus, the family daily food expenditures could be Table 2. This would allow them to undertake a full day of diligent manual labor, and still have a reasonable balanced budget. Zambia : Moving the porter family to Zambia where the husband is loading and unloading 10 t lorries. The family daily energy requirement remains at 8750 kcal as is the desire to provide the young children an egg/day to minimize stunting. In Zambia the official minimum monthly wage for general workers is ZK 699 which converts to US$ 58 or $2.00/day. Again, if he can only spend 80% on food, the food budget would be $1.60. In Zambia the only way he can obtain the needed calories is to rely on maize meal at $0.27/kg . The maize price is 1/4th the price of alternatives including rice that is widely grown in Zambia. To use alternative stable crops would require spending more than the $1.60/day budget just for the staple energy food. It would require: Table 3. Possible Daily Food For Family of 4 Earning Minimum Wage in Zambia Item	Amount	Cost ($)	Calories (Kcal)	Protein (g) Maize meal	2.1 kg	$ 0.57	8000	200.0 Eggs	2 ea	$ 0.16	142	12.5 Fish	0.5 kg	$ 0.62	390	80.0 Cabbage	0.5 kg	$ 0.27	125	6.5 Totals	$ 1.59	8,658	299.0 3.3	kg of rice costing $2.48, 2.3 kg of pasta costing $2.28, 5.3 kg cassava costing 2.17, 10 kg white potato costing $5.60, or 9.8 kg sweet potato costing $12.15 With maize it is possible for the family to meet their energy requirements to optimize their economic opportunities. They can also include an egg for each child but no milk for the infant nor any vegetable oil to assist preparing the food. A possible daily food consumption could Table 3. Ethiopia: Finally move the hypothetical porter and family to Ethiopia but continues to load and unload 10 t lorries. In Ethiopia the minimum agricultural wage is 50 Birr/day which equals US$ 2.63. Again, he can only spend 80% or US$ 2.10 on food but still needs 8500 kcal for energy and wants to provide the children an egg a day. While he would like to eat teff, the national grain of Ethiopia, it is three times as expensive as maize meal, and even 1.5 times as expensive as rice. Allowing some Teff the food must concentrate on maize meal. It is also possible to include an egg for each child, but that is about all. Chicken is the cheapest meat protein, but the family can only afford 100 g for the day. There is no milk Table 4. Possible Daily Food For Family of 4 Earning Minimum Wage in Ethiopia Item	Amount	Cost ($)	Calories (Kcal)	Protein (g) Teff	0.5 kg	$ 0.60	1835	128.3 Maize meal	1.5 kg	$ 0.62	5715	142 Egg	2 ea	0.32	140	12 Chicken	0.1 kg	0.69	215	18 Totals	$ 2.28	7905	317.3 for children and no vegetable oil to assist with meal preparation and fresh vegetables. A possible daily food consumption could be Table 4. Giving up some Teff would allow some more diversifying of the diet. Commentary While the article is conceptual and the family hypothetical, the wages and consumer prices were real. Thus, the case studies emphasis the difficulty of purchasing a balanced diet with minimum wage and the need to fully evaluate the importance of manual work energy in nutrition studies when the beneficiaries’ economic opportunities are limited to high manual labor employment or farming. It is possible that a person with a more nutritional background could tamper with the food purchase mentioned above but unlikely it will result in the quality diet desired to meet a family’s nutritional needs and while the current emphasis is on improved diet for pregnant and nursing women, it has to be recognized to obtain that diet someone in the household is obligate to some hard manual labor consuming 4000 kcal/day. While for the case studies discussed above, in 3 of the 4 countries it was possible to obtain the necessary daily calories needs by the hypothetical family including the 4000 kcal to optimize the husband’s economic opportunity, and even include an egg for the children. However, there was not much else they could afford, and some critical needs had to be overlooked. It also must be noted that the family was relatively small for most developing countries. The more typical larger families will require more calories putting more pressure on obtaining a well-balanced diversified diet. Conversely a smaller family would have an easier time. Also it is noted that the calories obtained are considerable higher than mention in the beginning as being available to smallholder farmers (Table 1). Thus, the farmers are sacrificing energy and economic opportunity for more diversified diet, smallholder farmers are economically worse off than wage laborers, or most likely the government does not have the financial resources to enforce minimum wages and many employers are paying below the mandated minimum wages. Future Needs The article highlights the need for: 1. Nutrition studies to consider the economic opportunities of the beneficiaries likely requires heavy manual labor and large calorie consumption, wish probably has priority over improved nutrition. 2. Within the overall effort at improved nutrition with emphasis on pregnant and nursing women, who is responsible to determine if the scientific results are financially feasible for the beneficiary’s households? 3.	Review the calories needed by manual labors. The article used 4000 kcal as a computed estimated based on some internet values, but this needs to be confirm as it could be considerable higher . With the current availability of sport watches that monitor calorie exertion getting solid data on calorie exertion should be relative simple to obtain. 4. There is a need to look at the relationship between nutrition and manual labor, including if supplemental food interventions will substantially increase productivity and food security. 5. Future development projects should but more emphasis on drudgery relief, which for smallholder farmers implies access to contract tillage and other forms of mechanization. 6. Be careful of manual labor intensive “appropriate technology” innovations such as treadle pumps and bicycle based processing to make certain beneficiaries have the energy to operate them. The example would be treadle pumps that have been widely distributed by NGOs, but very limited open market sales. How often are those distributed by NGOs quickly set aside by recipients in favor of small petrol pumps? Does it require an advanced appointment to see one in operation? 7. As a policy minimum wages should be set to make a quality nutritional diet affordable, although this may be the case. Just not enforceable! 8. If most of the population is spending over 80% of their income to purchase a meager diet, there is not enough discretionary funds available in the population to have viable tax base to fund civil services, including enforcing minimum wages. 9. Does the limited purchasing power of the majority of a countries population put sufficient downward pressure on consumer prices so private food value chain participants have razor thin profits making it exceptional difficult for a administratively cumbersome business model like a cooperative to effectively compete without forcing the producers deeper into poverty. Richard thanks for the info commenting on this article. Your site is well designed to explain the issues. Sometimes it's still hard to believe life is this hard for people that eating is a concern, yet even in America it is. The depth of your article seems overwhelming to ever fix the issues. From a marketing stand point to get them solved, may I offer an idea? If the solutions are the first thing people read they will remember them better and be likely to continue reading. We have to fully understand the issues at hand which you've done well, as has Cecilia. But that depth should be after people see solutions and find hope to carry them through. As I review what I learned in calorie determinations and nutrients for growing in Grow Biointensive to setup plots, it seems like 2 hour per person a day average would be ok time commitment. If you have a small family and impossible for a large one. Food forests designed to offer complete perennial food solutions seem like the best way to move forward due to their natural regeneration of soil and continuous production. A transition from GB first to Permi seems like a solid plan for people as a long term solution, as it requires little land and can be managed as community. Does not require machines at community level. Although I have seen people help people do this, only for the locals to abandon the project that would save them. Farm trainers can hardly instil in people that they must love themselves enough to do whatever it takes to survive, which from all the people I've talked to is a main issue. People refuse to adopt new techniques for many reasons. If you were going to offer a solution to flip a community over to a sustainable food farming program, what farming methods would you focus on and what are the top 5 issues you think would need addressing to make it stick? I would think it would be something like: 1. Instill a mindset that all things are possible for people who are willing to do what it takes. 2. Be prepared to change your entire life if necessary to survive. (I've had to use this many times in America) 3. Commit yourself to permaculture practice and GB to grow food as a means of making long term wealth out of soil, sun and water. Emulate the creator of the universe and make food in a forest, it was documented well for us to know this as a reality for a reason. 4. Teach and bring others with you in food security, it can't be done alone well. 5. Without biblical moral ethics, trust, honor, peace, helpfulness, selflessness, love of others, patience etc, it will be hard to get along with others and will increase the likelihood of failure. (I put this in because if people have no morals, they almost always end up doing whatever is best for them alone, which ultimately is failure and a cause of corruption of society) 6. One more,,, Teach people to mitigate and overcome conflict and instill forgiveness as a way of life. What is your take?